Carol’s mother did not sew, but her father’s parents were sewers so her dad helped her sew a bit when she was young, but mostly she was a tomboy. She grew up in the south suburbs of Chicago, went to the University of Illinois, then to the University of Chicago for her MBA. She later moved to Naperville because all her friends lived in the area and it eliminated the drive back and forth from the city to visit with them. When a friend talked her into taking a quilting class with her almost thirty years ago, she became interested and figures she’s been to the American Quilter’s Society show in Paducah almost every one of the past twenty years – that speaks volumes about her enthusiasm for quilting! Although she does most projects by machine, she also enjoys Sashiko and African embroidery hand work. 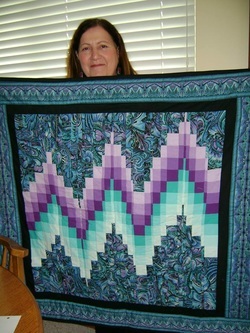 Carol readily admits she tries to find the easiest ways to do the piecing and quilting. 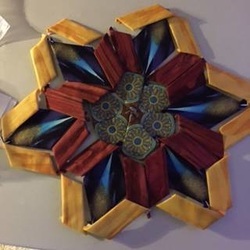 She is now working on the paper piecing project, The New Hexagon Millefiore Quilt-Along, by Katja Marek. It uses a multi-color base fabric and then pulls colors from the base to create stunning hexagons of various sizes. See photo for some of her fabric layout planning. She has also enjoyed doing “stack & whack” in years past and a workshop with Pat Bishop. Because of her many hours of working f or AT&T all of the Chicago land area, she did not have time to get involved and finish quilting projects as she had hoped and accumulated many quilt projects waiting to be completed. Now very happily recently retired, she is working toward improving her machine quilting skills and getting those tops done!